At the end of the nineteenth century, during the successive presidencies of Porfirio Díaz, railway building leapt forward. Díaz aggressively encouraged rail development through generous concessions and government subsidies to foreign investors. 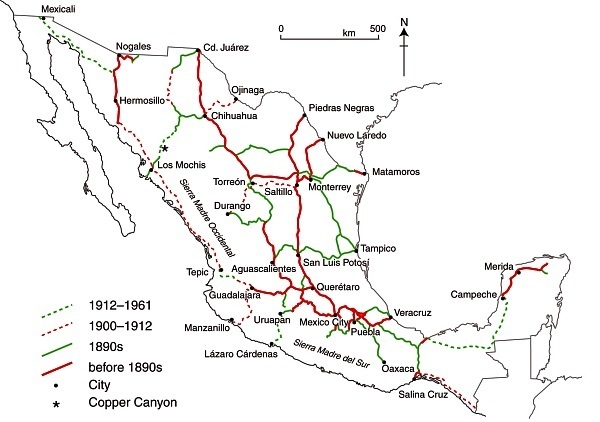 By 1884 Mexico had 12,000 km of track, including a US-financed link from Mexico City to the USA through Torreón, Chihuahua and Ciudad Juárez. A British company had completed lines from Mexico City to Guadalajara, and from Mexico City via Monterrey to Nuevo Laredo. By the start of the twentieth century, additional tracks connected Guadalajara, San Luis Potosí and Monterrey to the Gulf coast port of Tampico. A line connecting the Pacific and Gulf coasts was also completed. Durango was now connected to Eagle Pass on the US border. A second line to Veracruz was constructed, with a spur to Oaxaca. Laws passed in 1898 sought to bring order to the rapid and chaotic expansion of Mexico’s rail system. Foreign concessions were restricted. Subsidies were only made available for the completion of missing links such as lines to Manzanillo and the Guatemala border. Efforts were made to standardize track gauges. After the Revolution, network improvements were hindered by poor administration, corruption, labor unions and a shift of government priority to roads. The west coast railroad from Sonora to Guadalajara was completed in 1927. The Yucatán Peninsula was joined to the national network in the 1950s and the famous Chihuahua to Los Mochis line through the Copper Canyon was completed in 1961, finally linking Texas and Mexico’s northern plateau to the Pacific Ocean.